Fort Collins band Slow Caves are setting up for a breakout year. Already booked to represent Colorado at this year’s SXSW, the band is premiering their new song “Out Of State” from their upcoming Falling here with The Colorado Sound. They’ll also be playing a special Colorado Sound Presents album release show March 23 at Globe Hall. We caught up with Slow Caves to talk about the song, Falling, how the band best ends its typically high-octane live shows, and more. The Colorado Sound: “Out Of State” is a great track with a little bit of a 90s vibe, ringing guitars, and some well-placed reverb. There’s also Britpop, elements of shoegaze, certainly straight up rock, combined with 90’s style Pavement-esque punk. What’s your favorite genre to draw sounds from? 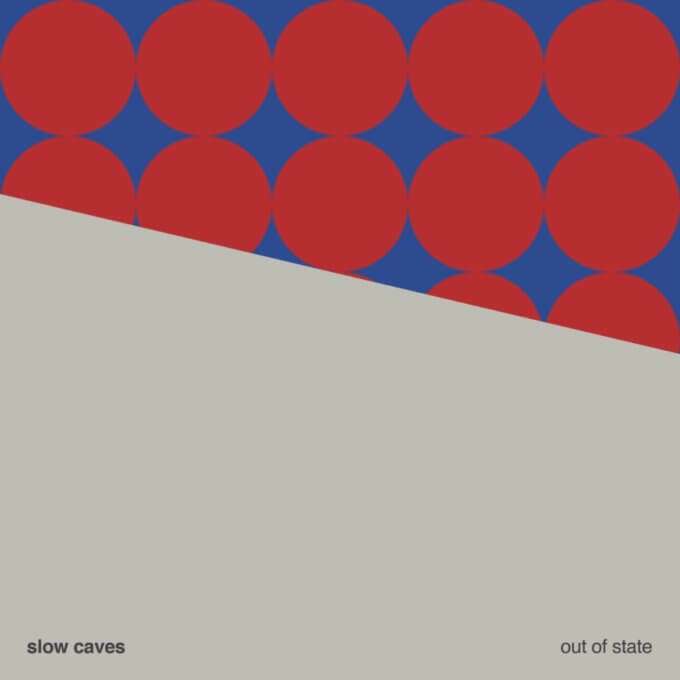 Slow Caves: All of that is spot on! We became obsessed both Britpop and shoegaze bands when we started writing this record. Those bands most definitely influenced the sounds and vibes on our new record. But our songwriting is maybe most influenced by the great power pop band, Guided By Voices. Robert Pollard’s use of chords and melody are unparalleled in modern rock music. “Out Of State” is dense, so take us inside the recording process to give us an idea how a three-piece outfit pulls off such sonic fullness? In all honesty I think the density and sonic fullness came from working with a great producer/engineer, Frenchie Smith. The drums and bass on the entire record were done live, then we added two guitars on top of it, like we do live. So, the fullness didn’t come from having layers upon layers of guitars or keys, but from great production from someone who was part of the era from which we were drawing inspiration. We feel so lucky to have made a record with someone who understood our music even better than we did. Clever lyrics. I love how they’re a bit ambiguous. When you sing, “get away from out of state” are you getting out of a certain mindset, or Colorado… or, is it something else? This song is somewhat ironic because it’s a pretty upbeat song, but lyrically it deals with depression and feeling stuck. Getting “out of state” refers for working through depression and asking for help. I guess it ended up being a pretty positive song lyrically when I think about it. It’s easy to picture you turning it way up on stage, given how it rings musically, and dares us lyrically. What do you hope your crowd gets out of the song? We absolutely turn this one up live, and it connect with us deeply every time we play it. So we hope that resonates with people and that they can cut loose however they want to. Your new album comes out on March 23, with a show that day at Globe Hall in Denver. What can we expect from the rest of the album? We think this album is so cool and we’re really proud of it. It’s extremely dynamic musically and lyrically. Some of the songs are the heaviest we have ever written, and others are the lightest and most pop type of songs we’ve ever written. A ton of growth has come from writing it and preparing for it to come out. Plenty of touring ahead, too. Including SXSW in Austin. So what was it like to be the only Colorado band to make the initial lineup announce – quite an achievement. We were very honored to be part of that initial announcement! The lineup is looking so good. Can’t wait to see so many friends down there from around the world and from Colorado. You’re one of the hottest bands in the state. So, we have to ask: how do you represent the “Colorado Sound”. Oh, I love this question. I don’t exactly know what Colorado’s sound is. I feel like everyone in the scene is so unique and is doing their own thing. And it’s beautiful! So maybe being creative and inventive is part of the “Colorado Sound?” If that’s it, I think this record definitely contributes to it well. Good things seem to keep coming your way. Where do you aspire for Slow Caves to be this time next year? Touring, touring, and more touring! Our goal is to be playing internationally. We think people will connect well with our music in Europe because we draw inspiration from tons of European bands. We’ll also be well on our way with the next record. And finally, a little bit of a fun one. You get to close a sweaty, high-energy show. Some dude calls out “Freebird” which you are totally not going to play. But you look to one another and want to pick a cover that’s going to absolutely slay. Which cover would it be, and why? Oh this one is easy. “Beetlebum” by Blur. That song slaps in every way. It has a perfect balance of heavy and delicate. 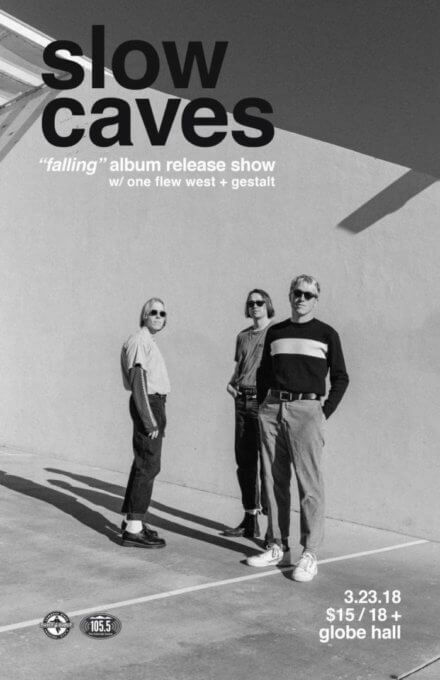 You can see The Colorado Sound Presents… Slow Caves for their album release show at Globe Hall March 23. Tickets are now on sale.